I have music on a lot of portable devices now, including my cell phone, my iPad, my iPod Touch, and even a small iPod Nano (not to mention my Windows and Mac computers.) My wife has her music on her iPhone too. And playing music directly from the portable devices either means personal headphones, or playing through the built in lousy small device speakers, if it even has one. So how does one share with the room, or listen without headphones? Or even put on dinner music, music for cooking, or maybe music for a party? I do have cables that let me connect my devices to my TV surround system, but that is in the wrong room for most occasions. 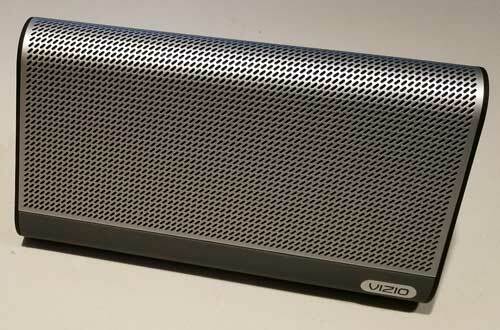 So I have considered a Bluetooth speaker for a while now, and was pleased to get a chance to try out the Vizio Crave Go™. I should point out that this is much more than just a Bluetooth Wireless speaker, so please read on. The Crave Go™ is a portable, rechargeable Bluetooth and WiFi speaker device with VIZIO SmartCast™ technology, which I will cover in a bit. The unit measures 8.6 inches wide, 4.9 inches tall, and 1.5 inches thick and weighs a not so light 3.5 pounds for a portable speaker. There is a kickstand on the rear, where there are also a 3.5mm pin style input, a USB port with a ½ amp charging capability (making it a spare battery pack for your phone), and the on-off/function button. It is slender with rounded top and bottom, making it comfortable to hold, and reclines about 20 degrees on the kickstand. On the side of the unit are a Bluetooth paring, volume rocker, and play/pause buttons. It is easily portable around the home for sure, but 3.5 pounds is a lot of weight to carry with you all the time. Battery life is claimed at 6 hours, although I never ran it that long, I did leave it playing well over 4 hours. The case is made of aluminum and a rubberized plastic, so it seems quite sturdy in design. It retails for $199. OK, ignoring all the documentation, I decided to just try it out. Who reads instructions anyway? Removing it from the box, I powered it up with the included wall-wart power supply, pressed the power button, and it started by flashing an LED button on the back of the device. 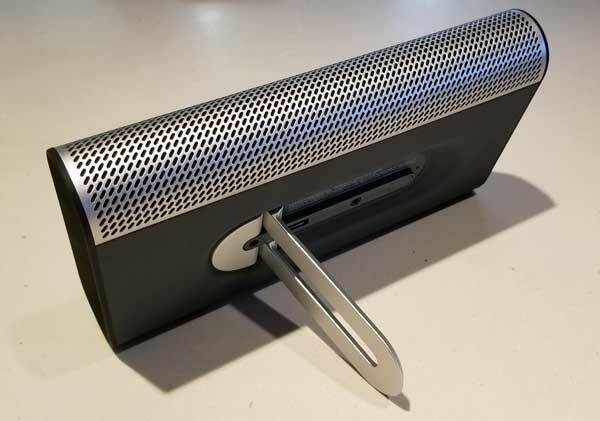 What sets this device apart from most Bluetooth speakers is the Vizio SmartCast™ feature and app, which allows you to connect it to your WiFi networks, and “cast” audio directly to the device without Bluetooth. You will need to download the SmartCast™ app on your devices (in my case, an iPod Touch and a Samsung S8) to use this feature. 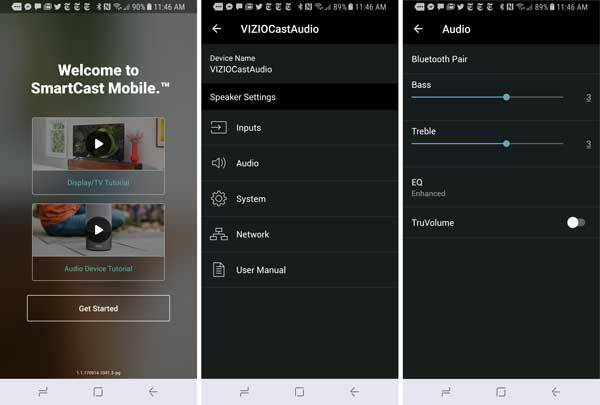 First, the Vizio SmartCast Mobile™ app lets you control the some aspect of the speaker’s settings. Here you can change Bass and Treble settings, pick one of two EQ settings (Natural and Enhanced), and set “TruVolume” on and off, which seems to limit the volume some. You can also rename inputs with the app as well; say you wish to change the “AUX” input to the “iPod Touch” input for example. You can also set a Sleep Timer, and turn on Eco Power to extend battery life, update the WiFi settings, and read the User Manual. 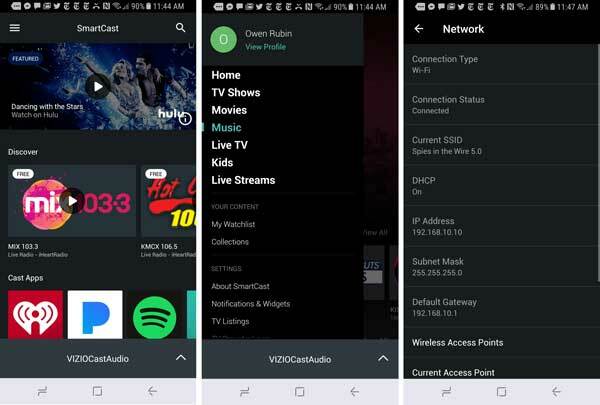 Note that the SmartCast™ service is just Google’s Chromecast service with Vizio’s own app for control. On your device, apps that can cast to this speaker (or any Chromecast device) show a small cast logo (above). 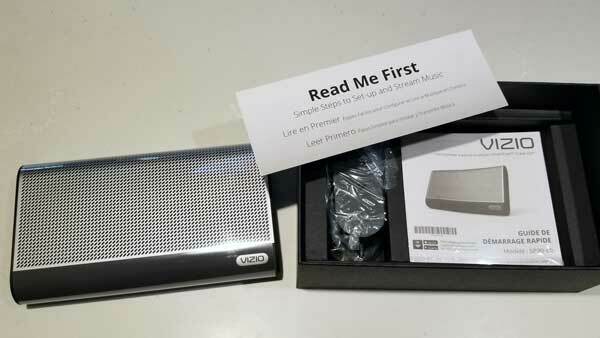 When selected, you can then send audio (or video if you have a video device) from your device to the Chromecast target, say a TV, Chromecast adapter, or cast capable speakers such as this Vizio Crave Go™. So much for this being easy, but I decided to keep trying. After 5 tries on the iPod, I finally got it to work, I was asked to name the speaker, and I was ready to cast. And once it worked there, I could more easily add the speaker to my other devices with the Vizio app simply by “adding a device” and picking the newly named speaker. WHEW! How would the average home user figure this all out? So ready to cast, right? Guess what? This speaker does not support Airplay™. On an iOS device, you cannot send music from the Music app via SmartCast™ either, as Apple apps do not support Chromecast. So no music this way from your iOS devices. Given that Apple is entering this market with HomePod speakers, perhaps Apple refused to license the technology to Vizio, or Vizio just decided to pass. To bad really, as the speaker should not care about the device. And surprisingly, the default music player on my Samsung Android phone did not support casting either. I could download a number of music players that did have cast services on Android Play. However, I could not find an app to do this on iOS. In fact, many of the audio apps I use on my iPad (Audible for example) did not have the ability to “cast.” If you have iHeart Radio, Pandora, Spotify, and others, then you can cast them directly to the speaker, although some may require a subscription. On Android, this was less of a problem, but even there not all sound apps cast. A bit later, I was told casting is for online apps that provide streaming content. It was not clear at first, but when you cast, you are actually sending the streaming URL to the speaker, which grabs the content from the Internet, instead of it coming from the phone. Seems to me that the manual Bluetooth paring, which works for any audio app on any device might be a better solution in many uses, especially on iOS devices. But you loose the “cast” features, which really differentiates this speaker. And, once I did get casting working on Android, using SmartCast™ worked beautifully for the most part. For apps that support casting on iOS, they also performed well. This speaker also supports multi-room casting to create multi-room synced audio playing. I only had one Vizio device to test, but was able to test multicast by casting to this speaker and my Google Home. I just created a “cast group” in the Google Home app, and then selected it as the casting destination from any cast enabled app. That was very cool, as synchronized music now played in several rooms in my house. And even more cool was that commands to my Google Home device (like pause, play, skip, etc) now controlled the music on both devices. For full house music, this might be a better solution to the platform specific whole house systems like Sonos, giving more functionality at about the same price or less. Note that only one Bluetooth device can be paired to the speaker at a time, so to change devices, the currently connected device will need to disconnect first. The speaker does remember devices it has paired with before, so reconnecting via Bluetooth is simple. For SmartCast™, if a new device tries to connect, the speaker will disconnect the current device, even if playing, and simply switch over to the new requester. Not sure I like that actually, as anyone on your WiFi can hijack your speaker. Also note that you can use a stereo RCA pin-plug (male to male) wire and connect the speaker to the player’s headphone jack manually. I played my iPod Nano through the speaker this way, and it sounded terrific as well, but the device needs to be physically attached. I must say, this speaker sounds amazingly good, and much better than any Bluetooth speaker I have tried. Although I do not get a lot of stereo separation while listening, the sound quality is fantastic for such a small speaker. It has excellent bass response, and the highs are crisp and clean. And I find it puts out enough volume to easily fill a large room with very low distortion at higher volume levels. This is not true on many smaller Bluetooth speakers. Do note that the bass response is quite good, and as such the device can cause vibrations on whatever surface it is placed upon. I made the mistake of putting it on a metal outdoor table, and the vibrations from the table were quite annoying. A good solid surface will provide best results. As stated above, setting up casting was a pain, and I am not sure why. This was much harder than it should be. Casting has some issues, and again I am not sure if this is a speaker problem, or a Google problem, or even a network problem. Most annoying is that playback would often not continue to play through the speaker after stopping and restarting. This usually required turning casting off, and back on again to restore it. The three tone pairing and setup sound needs to be MUCH more quiet. It is quite startling every time it happens, and WAAAYYYYY too loud. It will make your heart jump when it surprises you. And it happens every time you turn on the speaker, and quite unexpectedly. Even after a few weeks of use, I still jump when the speaker lets out one of these loud bleeps. Lastly, the kickstand on the back has an annoying habit of closing when you move the speaker, causing the speaker to fall over. It really needs a lock position. For a reasonably priced Bluetooth speaker, this device does an excellent job. It looks good and it sounds good. Add in Google casting, and the speaker takes on a new dimension of playback, and also cuts the Bluetooth distance limitation. Multicasting is awesome and I want several of these around the house now for whole house music. However, for travel, this speaker is a bit large and a bit heavy. It weighs more than my MacBook Pro! I do not see carrying this around a lot. And the annoyances above are just that, annoyances, and can be easily overcome. The lack of Airplay™ is a bit disappointing. Still, if you are in the market for a good Bluetooth speaker, I can recommend this product. I do not think you will be disappointed.